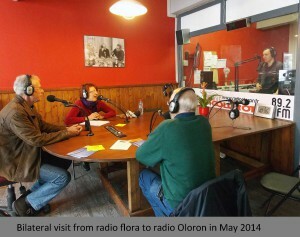 Visit to Oloron (29.-31.05. 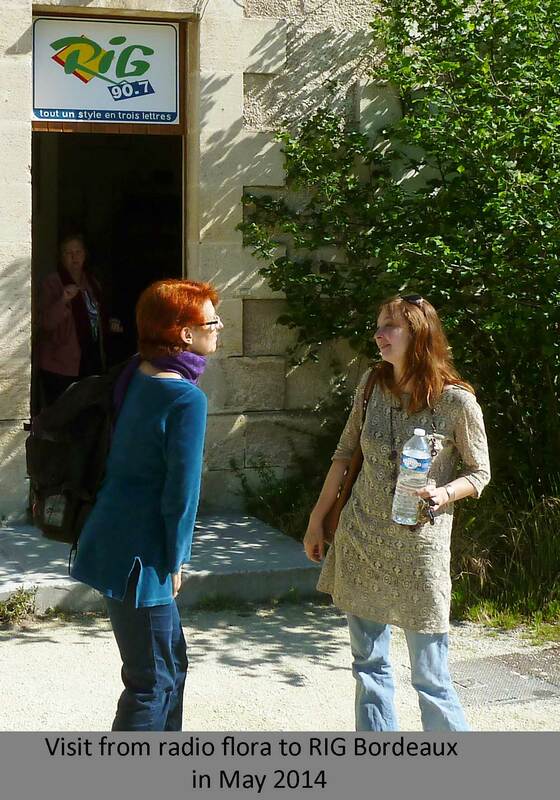 ): meeting with members of the radio; common radio programme; visit to the concentration camp of Gurs, guided by Raimundo Villalba from the Association Terres de Mémoire(s) et des Luttes; visit to the local music festival Mascalí. Visit to Hendaye: Sightseeing through the city and on the beach; meeting with members of the radio Antxeta; interview with Aitziber about history and functioning of Antxeta Irratia; Aier made a video about our investigations about bombing of Gernika and the responsability of Legión Cóndor in the destruction of this basque city and our contacts with members of historical memory in Gernika. Later in Hannover: Interview with Agus Hernán about topics of historical memory of Pausumedia (Red Cometa, GAL) and about the actual situation of peace process in Basque Country. Meeting of women from the international women’s space in radio flora with young member of Antxeta Irratia, Aleksandra, about feminist questions. 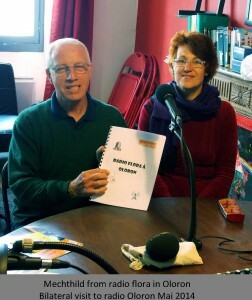 Radio programms about Antxeta Irratia, Pausumedia and Basque Country in different opportunities in the spanish space “Buena Onda” of radio flora. Visit of the ex-working-class-area of Linden, the city of Hannover and memorial Gedenkstätte Ahlem, former jewish horticulture-school and, from 1940, detention center and site of torture of the GESTAPO. Common radio programme at radio flora (21.02.2015) and visit to the memorial of the former concentration camp Bergen Belsen. Visit to the cities of Helsingsborg, Helsingör and Högenäs, site from where is broadcasting Radio Kärnan. Meeting with members of Radio Kärnan and realisation of a common programme; exchange about technical facilities and equipment of both radios and about their musical specials. Other topics were the increase of right-wing-movements in both countries and the problem of more and more precarious labour condictions in both societies. 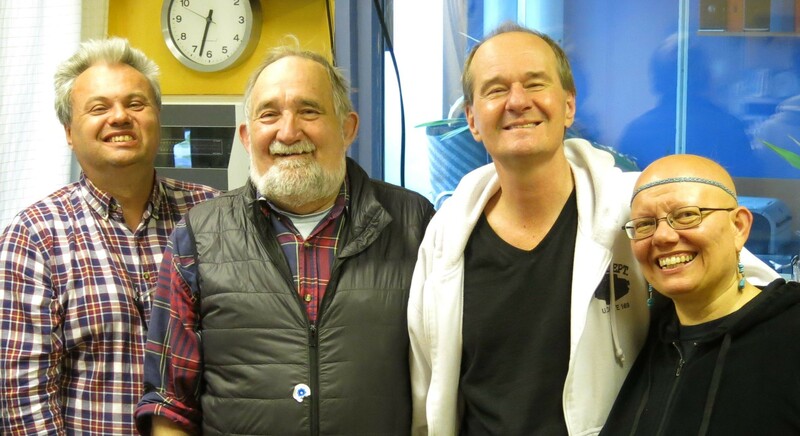 As part of the Grundtvig project I had to make the nice job and return visit with our new friends and Bo Ingvar from radio Kärnan (pronounced Schärnan) in Helsingborg. 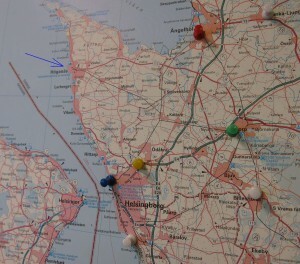 When I arrived by train on May 19, 2015 Helsingborg, I was received by two old friends in Helsingborg. 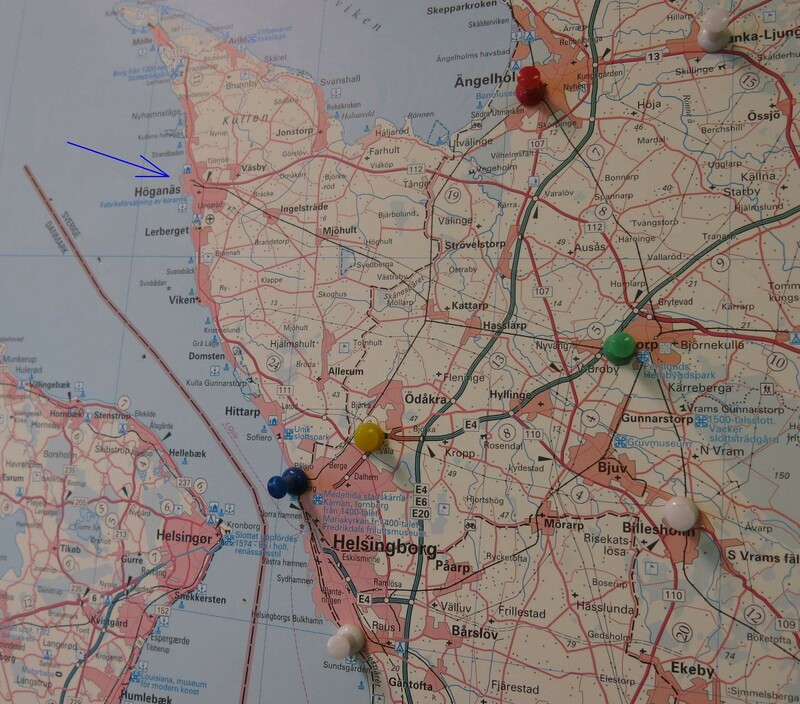 We went by car, because the radio Kärnan is in Höganäs, about 25 km in the north of Helsingborg. They took me directly to Bo and Ingvar. The radio station Radio Kärnan is one of 6 sub-organizations that share the frequency of “Helsingborgs Närradio 99.2″. The technical equipment of the radio station is not dissimilar to the radio of flora. A main workplace separated by a window of the moderator space, a production workplace, a conference table and a cupboard dor the server. The reception was very welcoming and made me feel “at home”. My aforementioned friends Jan and Anna were for the first time at Radio Kärnan and while I looked around, they had intensive discussions between Jan and Bo. Perhaps there is a future cooperation? In the following discussions, we found common ground in the Swedish and German society as a general shift to the right and an ever more populist media landscape. During my rounds I noticed also a separation of well-off North Helsingborgs a socially sloping south. The southern part is dominated by Helsingborgs higher proportion of immigrants and of shop vacancy. I found there also an initiative which furnish a studio for several artists in a vacant former supermarket. However, these few observations are not representative. All in all, my visit to Helsingborg was very productive for me and I want to say thanks again and warmly to the new and old friends. 29th May in the evening: Arrival in the railway station, there we were expected from David and Francoise, the president, left the baggage at the hotel de la Paix and went to the radio where we ate and talked. 30th May: In the mornings inspection of the radio, interview by Bernard and David as well as Jean Louis and Lucy on radio flora. Marion, the trainee was also present shortly. 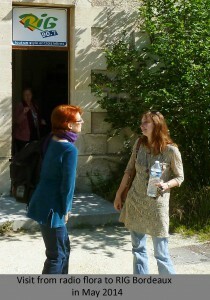 30th May at noon trip after Barcus, a small place close to the Oloron where we were invited for the lunch. In the afternoons visit of the concentration Camp of Gurs in accompanying of Raimundo Villalba and Milene Lacoste of the association Tierras de Memoria (s) y de Lucha – places of the memory and struggle. 31st May: Sightseeing of the city with her 3 districts and great lunch. Participation in Mascali festival, a local festival of local musicians and groups, which took place on 3 different stages. 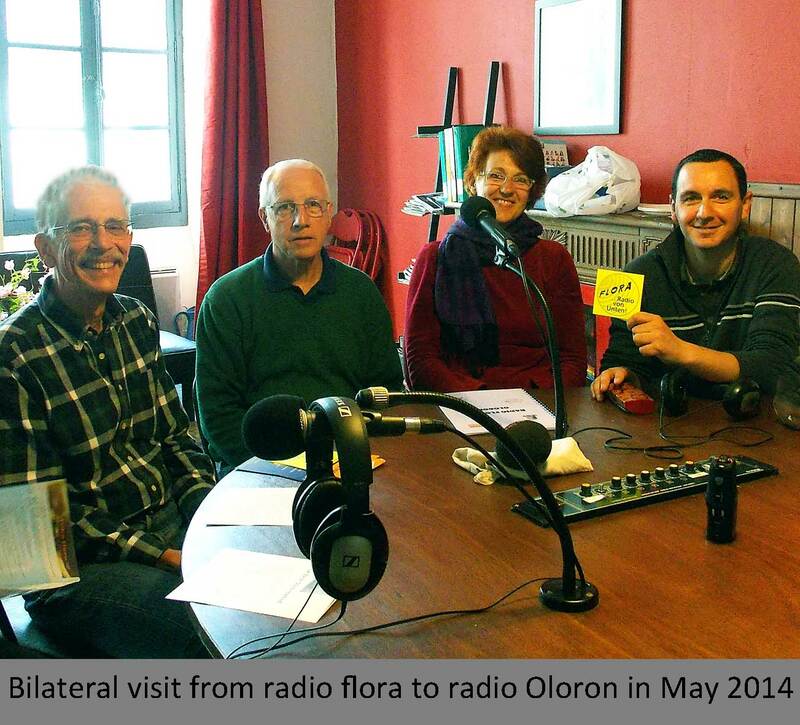 Interviews with founders, members and supporters of Radio Oloron and a German teacher, who organizes student exchanges and just had a visit from Germany. Return to Bordeaux in the early evening. 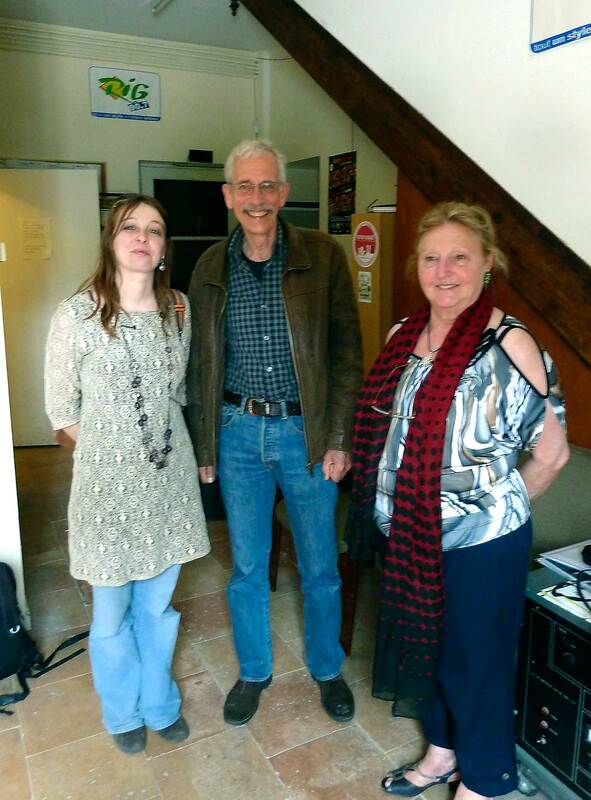 Mechthild and Hubert visited Antxeta Irratia radio in Hendaye and Pausumedia in Irun in the last days of October 2014. We were received by Aitziber, Aleksandra and Aier. 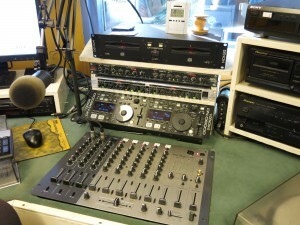 They showed us the city and the beautiful beach and the radio Antxeta Irratia. 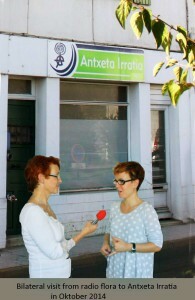 Aitziber told us in the interview about the history and current situation of the Basque radio station. Aier meanwhile interviewed us about our recent visit to Gernika and the work of historical memory in our region in Germany related, for example, to the bombing of Guernica by Nazi aviation (Legion Cóndor) in April 1937. Both radios we agree on the interest in this issue and that we need to continue making historical memory, in the Basque Country and Germany. 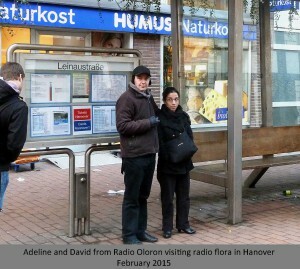 Subsequently, in November 2014 for a meeting of Grundtvig in Hannover, Agus Hernan from Pausumedia was interviewed on historical topics they are working on Pausumedia and Antxeta Irratia and on the current situation and the peace process in Euskal Herria. With Aleksandra, women from the international women’s space of radio flora had an interesting conversation about feminism and comparing the situation and ideas of young women in Germany, Poland and Basque Country.